Introduced in the 17th Century, courtyard garden squares have been a coveted feature of residential architecture in the UK for years, providing a communal centrepiece framed by properties. 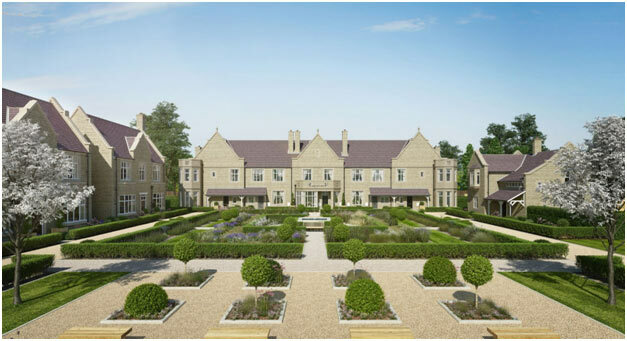 Keen to rediscover the charm of courtyard living for the 21st century, award-winning developer Spitfire Bespoke Homes has created a collection of beautifully designed new residences, in the historic grounds of the breath-taking Grade II listed Haseley Manor estate in Hatton, Warwickshire. Once owned by names such as Kind Richard I, King Henry VIII and Mary Tudor, the grounds now offer new residents an address of distinction rich in history. Accessed via a gated entrance along a private carriage driveway and overlooking a tranquil courtyard garden, Manor Terrace is an imposing row of five residences designed to complement the manor itself. Within this beautiful landscaped setting, the formal courtyard garden and focal water feature provide a striking centrepiece to the estate, framed by footpaths, swathes of open green space, ornamental planting and trees. Drawing inspiration from the historic Haseley Manor, dating back to 1873, Manor Terrace comprises a row of five distinctive three and four-bedroom homes showcasing elements of Gothic and Elizabethan style architecture. Exteriors features includes stone mullioned bay windows, hexagonal towers, traditional chimneys and porches. Internally, number one to five Manor Terrace offer all the luxuries of modern living, including individually designed kitchens bespoke to Spitfire, along with fitted wardrobes and a host of premium brands such as Siemens, Villeroy&Boch, Porcelanosa and Hansgrohe. In addition to the newly created formal courtyard, all houses at Manor Terrace benefit from private south-facing gardens as well as access to private parking facilities in the parking courtyard. 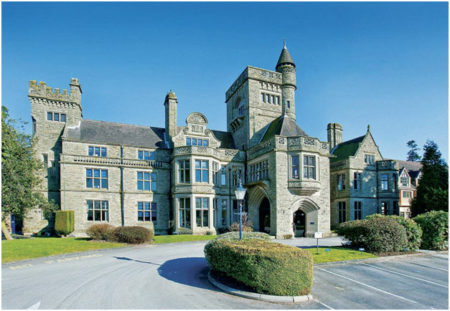 Alongside the collection of traditionally styled houses, the manor is being sensitively restored and converted into 13 impressive one, two and three-bedroom apartments, retaining the building’s existing character and period features, including a large central tower with a striking circular turret. All of the homes offer contemporary interiors and premium level specification that Spitfire is renowned for. Famous for its magnificent castle and historic charm, the thriving centre of Warwick is enriched with local businesses offering an enticing blend of the old and the new. Haseley Manor is only a ten-minute drive from historic centre, which provides an excellent selection of shops, cafes, pubs and restaurants. The popular centres of Leamington Spa and historic Stratford-Upon-Avon are also close by. With the M40 just a few minutes away providing excellent road links, Birmingham and Oxford can be easily reached in just 40 minutes, and London in less than two hours. Warwick Parkway railway station is just over two miles away and offers direct services to Stratford-upon-Avon, Warwick, Leamington Spa, Birmingham and London Marylebone. For Manor Terrace, prices start from £885,000, whilst the apartments are due to be released for sale early in 2019. For further information, please visit www.spitfirepg.co.uk, call 01926 485511 or contact selling agents John Shepherd or Knight Frank.